Now reading: Matcha Green Tea: Does It Matter Where It Comes From? Matcha: A versatile, antioxidant super food, with over 10x the amount of nutrients in regular green tea. Not only is it packed with anti-aging antioxidants, fat-burning catechins, but it is also overflowing with the meditative and relaxing-inducing compound, L-theanine. It is known to diminish the signs of aging, boost your immune system, increase your metabolism, and so much more! It is no wonder Matcha is the new hottest health trend. In order to get all these amazing health benefits, we should just go with the best deal Matcha we can get, right? Ceremonial grade Matcha is too expensive - so why not just buy the lowest price per gram Matcha I can find. Plus, now a days, Matcha is popping up on every corner of your neighborhood grocery store. It is found in soft serve ice cream, pancakes, and lattes -- every Matcha addicts dream. But is the Matcha in these sweets really as healthy it is purported to be. Hold your horses! If you're in it for the health benefits and delicious taste, don't just buy any random Matcha brand you see out there. In fact, the brand, grade, and location of where the Matcha is harvested has such a huge influence on not only the quality of the Matcha, but the amount of health promoting superfood nutrients and compounds! I have spoken before about the huge distinction between ceremonial and culinary grade and why you should always ditch the culinary grade for a higher, purer grade. You can continue reading why you should only drink ceremonial grade Matcha here. Aside from the grade of the Matcha, the location of where it is from can severely impact the quality and presence of health promoting compounds. Which is why we will now talk about why you should always drink Japanese Matcha! The method of preparing powdered green tea (Matcha) was introduced to Japan in 12th century by the Chinese Buddhist Monk Eisai. From there, the art and perfection of Matcha flourished into an thousand year old art form that is still practiced today, that is, the traditional Japanese tea ceremony. Now a days, Matcha is grown in two different countries: China, and Japan. China produces a lot of tea, including Matcha. However, considering that Matcha is seen less of a sacred object that is practiced in traditional tea ceremonies, and more of a commodity, less emphasis is put on the quality. Of course, this cannot be said of all Matcha grown in China. There are indeed brands that are of higher-quality than even some in Japan. 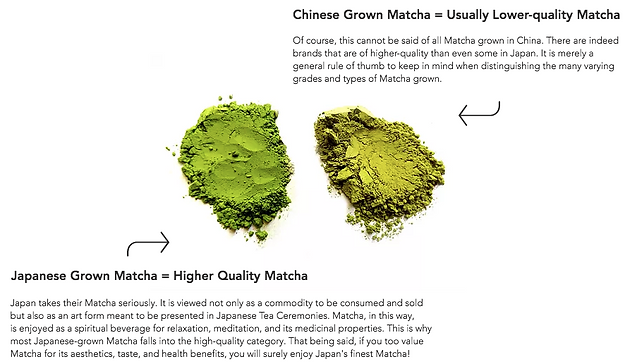 It is merely a general rule of thumb to keep in mind when distinguishing the many varying grades and types of Matcha grown. Japan, on the other hand, really takes their Matcha seriously. It is viewed not only as a commodity to be consumed and sold but also as an art form meant to be presented in Japanese Tea Ceremonies. Matcha, in this way, is enjoyed as a spiritual beverage for relaxation, meditation, and its medicinal properties. This is why most Japanese-grown Matcha falls into the high-quality category. That being said, if you too value Matcha for its aesthetics, taste, and health benefits, you will surely enjoy Japan's finest Matcha! High-Quality High-Smaulity - What Does It Matter? As I mentioned earlier, high quality Matcha not only tastes better than low quality Matcha, it is better for you! In fact, there is a correlation between the quality of Matcha and the presence of health-promoting compounds, such as L-theanine! Low quality Matcha lacks a sweet and savory umami tastes, which is actually the lack, therefore, of L-theanine! High-quality Matcha, on the other hand, is naturally sweet, slightly bitter (like dark chocolate), but with strong kicks of Umami! 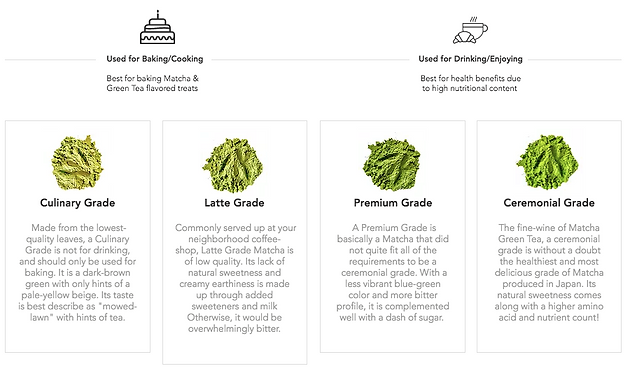 Next time you order Matcha, look for high quality grades (ceremonial) for the best experience -- taste wise and mood wise! 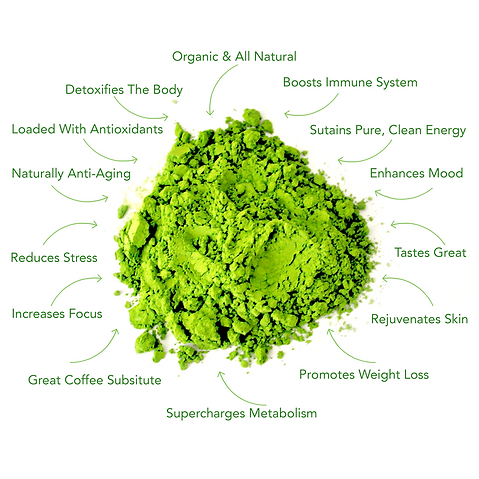 Benefits of High-Quality Organic Matcha! Where should My Japanese Matcha Come From? So now that we know that Japan tends to produce higher-quality Matcha, which in turn carries a higher portion of health promoting properties and compounds, there is a pending question of whether Matcha from different regions of Japan differ! Japan’s unique climate and rich history to Matcha and green tea preparation makes us wonder if it really matters where you get your Matcha from. Like how all blueberries sold in the US do not come from the same farm, all Matcha grown in Japan are not grown in the same region. In fact, Matcha is grown all through the varying regions of Japan, from the Kagoshima prefecture, to Kyoto! While the Western world does not seem to mind where Japanese Matcha is grown, the Japanese Tea market does. Japan is proud of Uji-grown Matcha, much like how France is proud of Bordeaux wine produced in Bourdeaux, France. Uji city is home to some of Japan's oldest tea fields and is at the center of Matcha Green tea harvesting and cultivation, and much like Texas Pecans, Florida Oranges, or Idaho Potatoes, Uji-Matcha is renowned for its exquisite flavor and rich history. Knowing the history and artistic care that comes along with Uji-made Matcha, we source our finest Matcha from the city. Try Uji-Matcha and you'll never go back! So, while there are many different regions where Matcha is grown in Japan, we prefer Uji-grown Matcha for its rich history and distinct sweet flavor! Don't forget that our finest ceremonial grade Matcha is on sale! For a limited time only, we are having a buy 2 get 10% off your entire order exclusive discount! More for yourself or for a fellow Matcha-lover -- order double the amount for 10% less! Or use SAVE10NOW at checkout! Only want one? No worries! You can still use our INSTAMATCHA15 discount for 15% off your first order of our ceremonial grade Matcha!